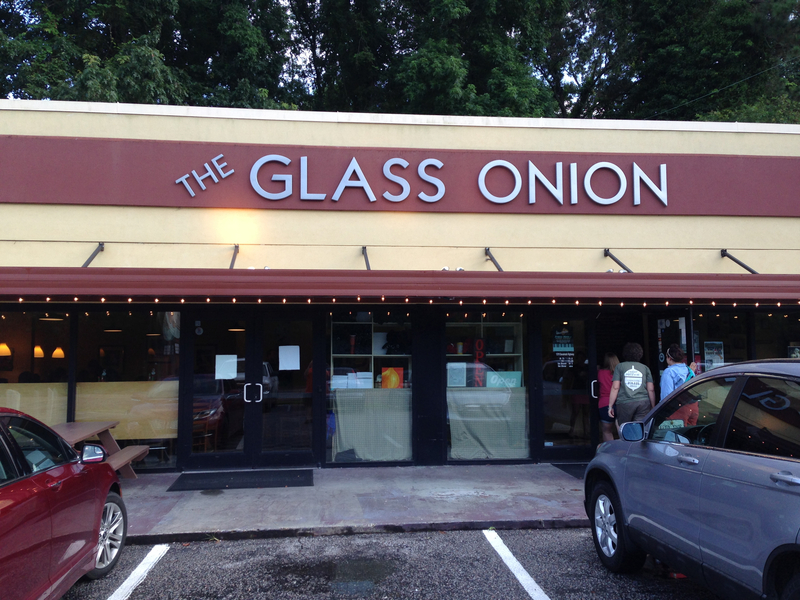 As we were heading to Charleston, I only had two places on my food list, the Glass Onion and Martha Lou’s Kitchen. 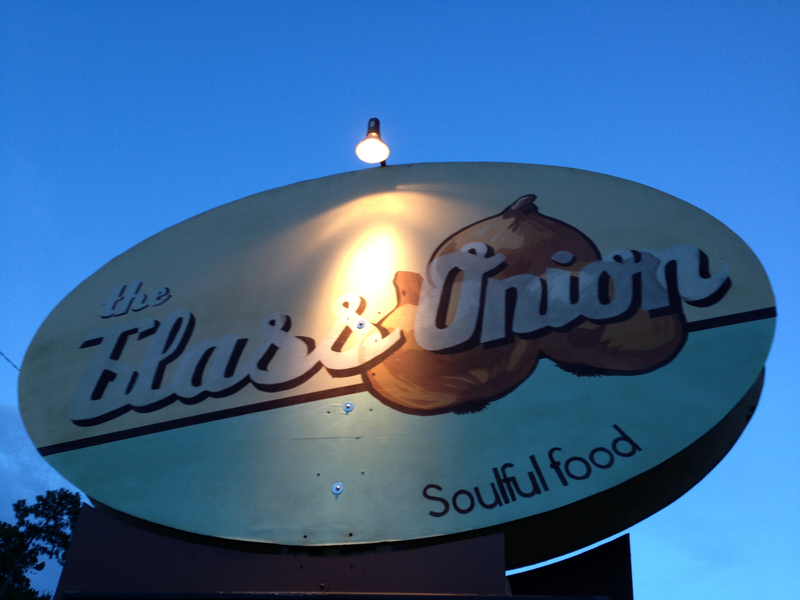 We heard about the Glass Onion on Road Trip with G. Garvin on the Travel Channel. Then I found out they had been on Diners, Drive-Ins and Dives. And then I read an article about a Southern Foodways Alliance dinner here in Atlanta where Sarah O’Kelly was one of the thirteen guest chefs invited by Anne Quatrano. I knew that this sounded like our kind of place. We arrived around 7:15 and were surprised that there wasn’t a wait – I attribute that to being the Friday after the 4th. 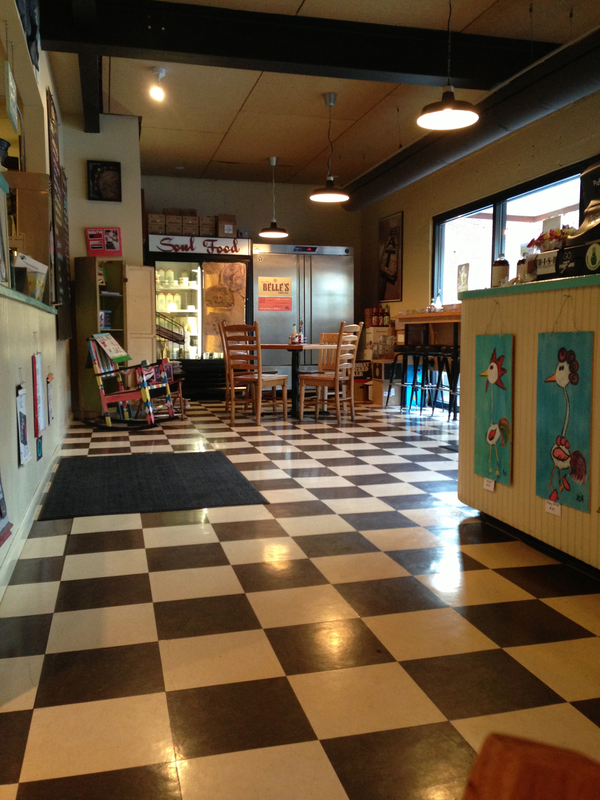 We walked through the main doors (above right) and were quickly seated at a table in the middle of the restaurant. 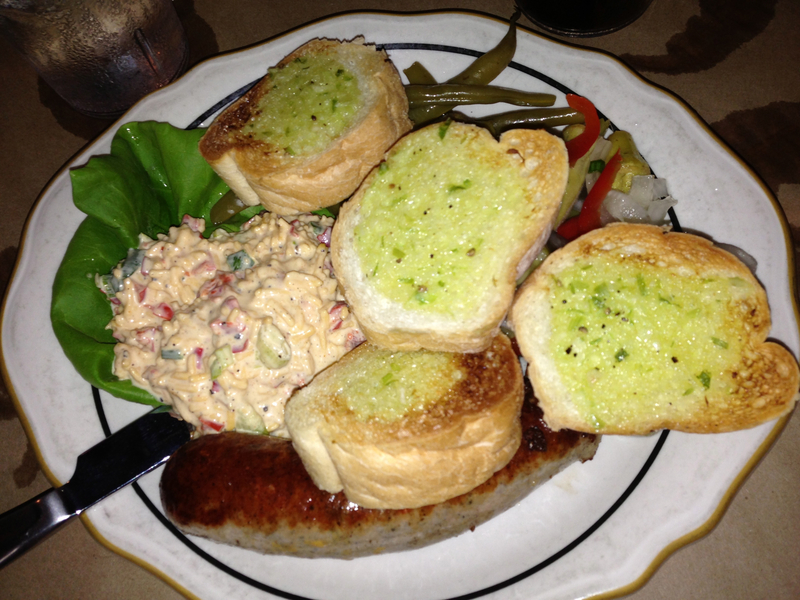 We decided to start with the sausage and the pimiento cheese with pickled vegetables and garlic bread. Being the farthest thing possible from a pickle fan, I can’t comment on the quality of those, but my table mates ate every one of the pickled okras and raved about the pickled green beans. The pimiento cheese itself was good, although it contained green pimientos in addition to the red, which put it into a bit of a pepper overload. The sausage was spicy and tasty. 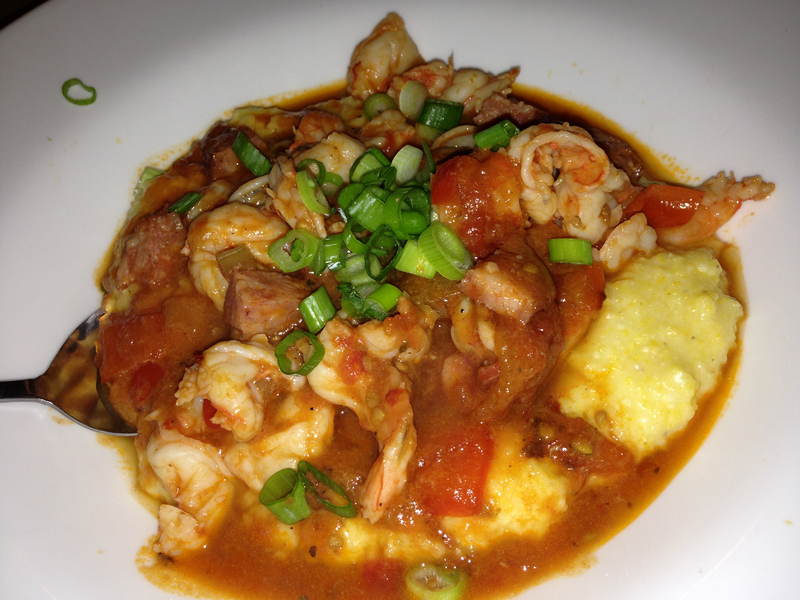 I ordered the shrimp and grits with andouille sausage and a roasted tomato sauce. 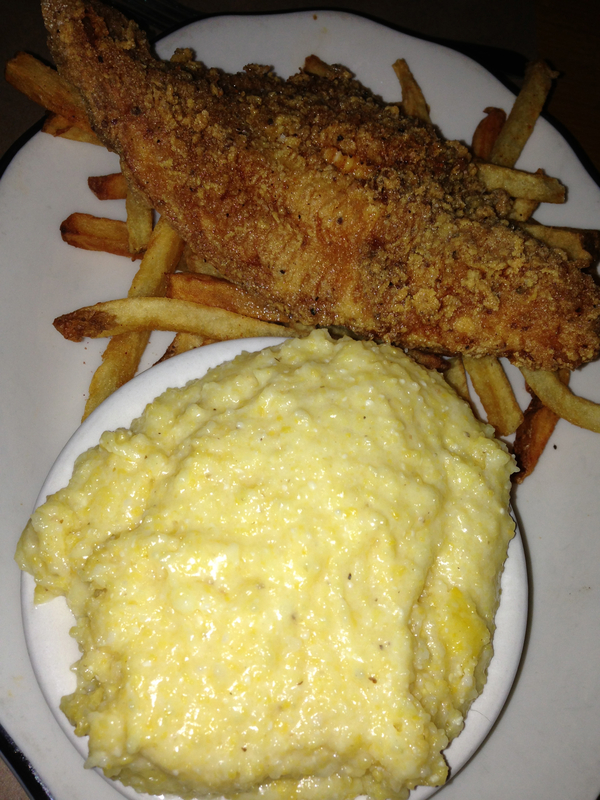 The sausage was particularly spicy, and combined with the thickness of the grits made for an excellent meal combination. Even though I usually prefer brown gravy shrimp and grits, the tomato sauce on these made these into one of my favorite S&G recipes. Definitely a winner. which was devoured. 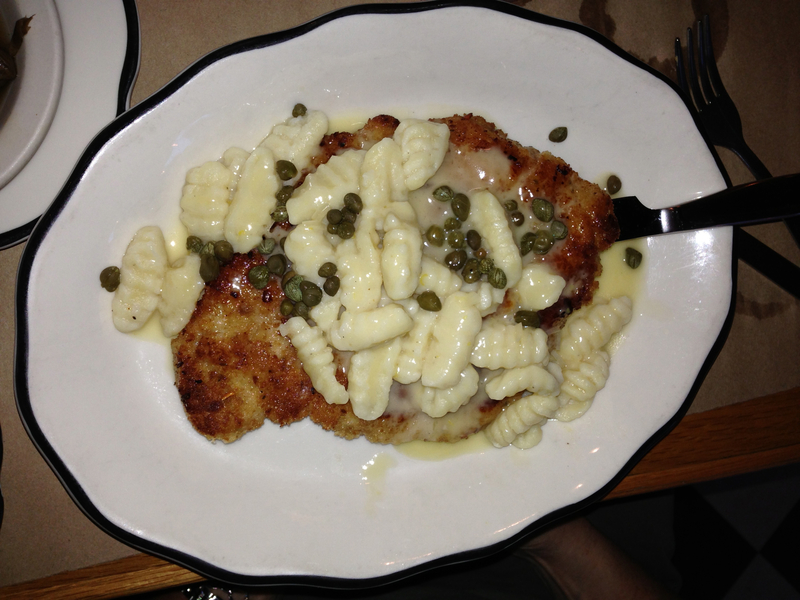 And the pan-fried pork chop with hand cut pasta, which looked like a well cooked pork schnitzel with pasta. That plate was cleaned as well.